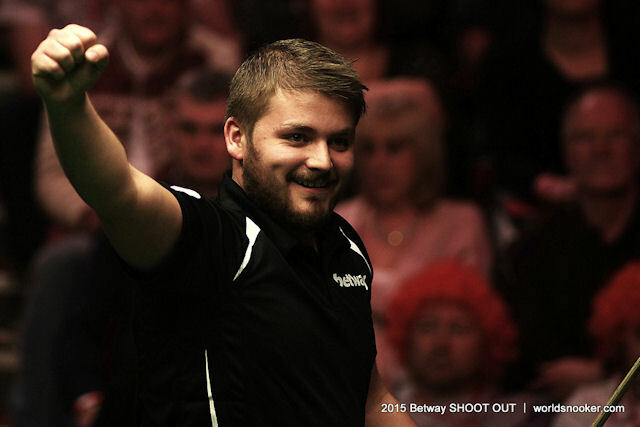 Michael White held his nerve in a breath-taking finish to beat Xiao Guodong in the final of the Betway Shoot-Out in Blackpool. A sensational three days of fast and furious snooker at the Circus Arena came to a fitting conclusion in a final which went to the wire. China’s Xiao led 48-39 with 30 seconds left when he missed the penultimate red. Welshman White kept his cool to pot red, pink, red and black to take a decisive lead with just six seconds on the clock. The talented 23-year-old from Neath won the first professional title of his career and with it a bumper cheque for £32,000. A player known for his natural fluency, White beat Robert Milkins, Judd Trump, Tom Ford, Ben Woollaston and Kyren Wilson before his thrilling final victory. White’s snooker gift was recognised when, at the age of just nine, he became the youngest player ever to make a competitive century. At 14, he became the youngest winner of the world amateur title. In his first few years on the pro tour he struggled to make progress, but then made a breakthrough in 2012 by reaching the quarter-finals of the World Championship, beating boyhood idol Mark Williams in a memorable Crucible debut. Now into the world’s top 32 – the youngest player in that bracket – White certainly has the game, and the temperament, to become a prolific winner. He heads to Mumbai this weekend for the Indian Open hoping to carry his momentum into the world ranking event. Xiao -another of the sport’s rising stars who was runner-up at the Shanghai Masters last season – came agonisingly close to the title having impressed throughout the event with his calm determination at the table. The 26-year-old takes home £16,000. White said: “It’s been a brilliant tournament for me, I have played well all the way through. The final was unreal – I can’t wait to watch it back. I had won nothing before, so hopefully this will set me up for bigger things. “When I had the chance at the end it was a case of whether I could do it under pressure, so to compose myself and get over the line means everything to me. I could have missed any of the last four balls, even the last black. People don’t understand how nerve-racking it is.